A couple of years ago, I wrote a bucket list here on the blog. I was so inspired by actually writing out the items that I ended up creating it into a whole page of my blog, so that I could reference it in the future as I checked items off of it! Bucket list item #42 is to "Go to the Kentucky Derby." During the week of May 10th, 2015, I got two big steps closer to that dream! I am not a big fan of most spectator sports. I did not grow up in a household that was really big fans of any particular sports. Neither of my parents are fans of football, baseball or basketball. A few years back the Boston Bruins made it into the Stanley Cup finals for hockey (and ended up winning! ), and my dad watched a few of the games on TV... and I honestly think that was the first time ever that a televised team sporting event (minus the Olympics or Super Bowl Half-Time Show) had been on in our house! Yet even though I was never exposed to it, something always captivated me about horse-racing. The beauty of the animals, the speed of the event, the thrill of the bets, and most importantly, getting dressed up in your finest attire, and topping off your outfit with a big hat! In the Carolinas, the biggest horse-racing event is the Carolina Cup, held in Camden, SC, annually in March. I have always wanted to go, but every year so far that I've been in college it hasn't coordinated with my schedule (it's on the senior year bucket list though!). During my sophomore year, in honor of the Carolina Cup and the Kentucky Derby, I dressed up Derby style for the Spring Formal dance that I got invited to at my former college! I never would have guessed that just over a year after this picture was taken, that I would be at Churchill Downs, the ultimate home of horse-racing in America, twice in one week! A couple of weeks ago I was in Kentucky, interning for the Fraternity Communications Association's annual conference. One of the evening events for all conference attendees, vendors and interns was to take in an evening of racing and dinner at Churchill Downs! We ate and watched races from Millionaire's Row, which is the private part of Churchill where some of the richest people in the country watch the Kentucky Derby each year from! It was an incredible and once-in-a-lifetime experience! But of course, I couldn't pass up the opportunity to head to Churchill Downs for a second time while I was in the area. I mean- since I couldn't make the Derby- why not visit twice on regular race days instead?! And to make it even better, my second visit to Churchill Downs was with one of my blog besties! My internship with the FCA ended late Friday night, and on Saturday morning my Kentucky blogging buddy Bailey from Becoming Bailey drove all the way to Louisville (in the rain!) to meet me at my hotel and pick me up for the races! We started our day with walking around the Louisville downtown area (and getting lunch at KFC- because when in Kentucky one must eat the Kentucky Fried Chicken! ), but then we headed back over to the race track. Unfortunately, my Millionaire's Row status from the previous evening wasn't still valid so we had to settle for General Admission seats. ;-) But I quickly learned that there is no such thing as a bad seat at Churchill Downs! 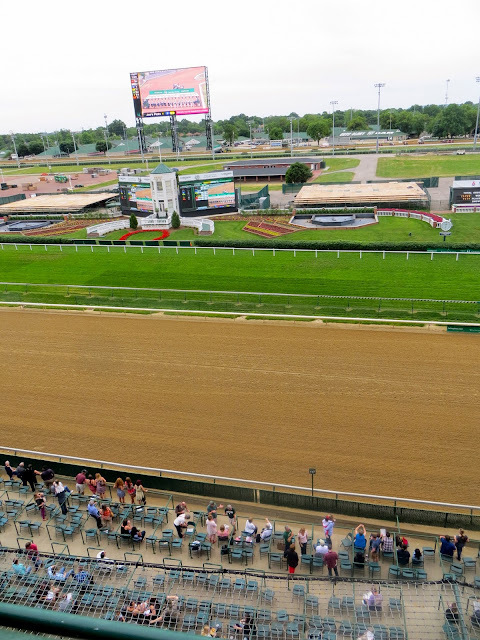 The General Admission seats that I had booked for us ended up having great views of the races, and it was really fun for me to experience a different side of Churchill Downs!! The rain didn't dull the fun and excitement of horse-racing! As we headed out, we passed by one of the stables where the horses that are about to go out are kept. Bailey and I enjoyed this strange sight! 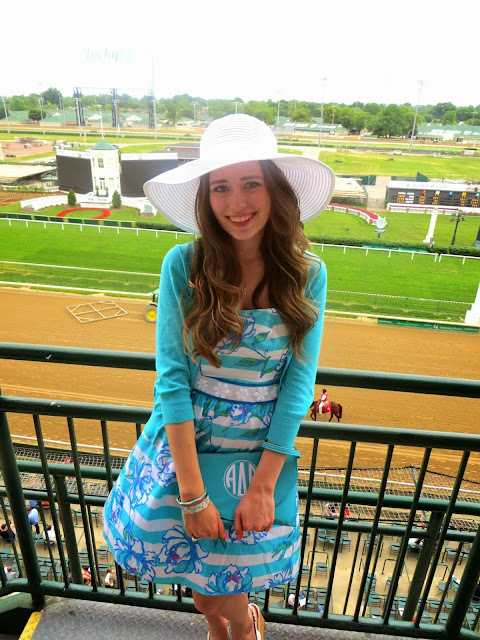 My time at Churchill Downs this year was an experience that I'll never forget! 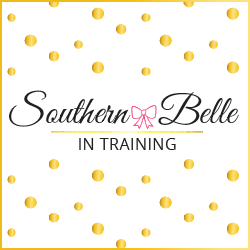 Being able to visit there during Derby month, and having one of those visit be combined with my passion for Greek Life and the other involve a blog bestie made for two incredible memories! Ahh, you look so stunning! I really do want to attend a race at least once in my life -- the Derby sounds so fun and amazing! I went to school in Kentucky for four years and never got to go! Hopefully I will go in the future. I know how it is to not have school line up with events. You look so pretty in all your pictures and look like you had an amazing time! Love that you're rocking your Lilly. It's on my bucket list to go to the Kentucky Derby as well! My boyfriend and I are planning on going next year. So exciting! I hope to eventually go to the Derby (my parents went a lot when I was younger) and also to the Carolina Cup! Oooooh, lucky girl! Horse racing is the only sport I'm an avid fan of, so much so that for a couple years my sister and I did major handicapping on the Kentucky Derby and in 2007 actually picked the winner, Street Sense (that's the only time I've picked the winner though; been close a couple other times, but not close enough). I've always wanted to attend a horse race, especially any of the Triple Crown or Breeders' Cup races. The major race in Washington State (not a big horse racing state, for sure) is the Longacres Mile at Emerald Downs, and I've never even been there :P I'd love to go though. Too bad you didn't end up going like a week or so later, or the Kentucky Derby and Preakness winner American Pharoah might have been back at Churchill! That would have been so cool to see him in person. Such a once in a lifetime experience! Knowing you, I have no doubt you'll figure out a way to get to the actual Kentucky Derby one day :) Have a wonderful weekend! This is so fun! I think I am going to add the Kentucky Derby to my bucket list now, too! Oh and I am obsessed with your hat! How cute are you?! It was so great meeting you! We'll have to meet up again sometime hopefully! SO JEALOUS! Churchill Downs is on my travel bucket list next year. You look adorbs, as usual! Sounds like such a fun event! Your outfit is adorable! I'm so glad you got to go, it looks like a blast! And of course all of your outfits are too cute! So much fun that you got to go! And you look beautiful! Definitely on my bucket list! I love your dress. HOW FUN! And you look so adorable! Omg how fun! I've been dying to go to some sort of derby. Especially one that I can wear a cute hat to haha. Sounds like you had an amazing time!! Love your outfit.